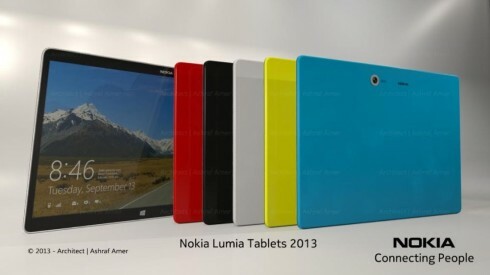 Recent speculations have insisted on a 12 inch iPad and a 12 or 13 inch Samsung tablet, so why not have Nokia make a slate with the same diagonal? Ashraf Amer imagined such a Nokia tablet, one that sports a 12.4 inch OLED flexible display. The device has a super slim shell that measures just 0.3 cm in thickness and inside we find 6 GB of RAM, 500 GB of storage, while at the back things get really out of hand. This Nokia tablet concept has an 82 megapixel Pureview camera with dual LED flash and at the front there’s a 20 megapixel Pureview camera with mono LED flash. The device also adopts NFC and comes in a variety of colors. The format is your typical rectangle and other than that I have no idea what hardware is inside. I’m guessing it’s either a future 8 core Bay Trail CPU or something like that or maybe some futuristic Snapdragon. For those wondering the device was created in 3D Max 2014 and rendered in Mental Ray, as he says himself in the video description below.